Gather for a meal and stay awhile at these delicious, welcoming neighborhood restaurants. [ Northwest ] We’re smitten with former Canlis chef, cookbook author and longtime Bainbridge Islander Greg Atkinson’s Northwest-inspired bistro on Bainbridge Island. Here, locals drop in for perfectly cooked steaks and salmon paired with carefully considered sides, and sublime French onion soup. More pluses: friendly service and a stylish dining room. [ Mexican ] You’re likely to run into a neighbor (and their kids) at the always bustling La Carta, where reading the menu is likely to induce serious cravings. We love the hand-smashed guacamole with house-fried tortilla chips and the tender chicken in Oaxaca’s signature sweet, sultry black mole. The tequila/mezcal display is particularly well researched. [ Deli ] The true heart of Bellevue lies inside this sweet sandwich shop on the weekends, when folks jockey for painted Adirondack chairs outside before catching up over whopping sandwiches and crisp salads. [ American ] The best weekend brunch spot in Seattle? We think so! Chef Ba Culbert’s cooking is comforting—and those Dutch baby pancakes with tender duck confit are addictive. It’s the neighborhood gathering place, with big windows, sunny servers and a stay-awhile atmosphere. [ French ] Le Pichet’s Capitol Hill sibling has an easygoing, functional charm, with a well-stocked newsstand up front and a French catch-all menu—oeufs plats, croque madame/monsieur, moules frites—that’s served from dawn until well after dark. [ Italian ] Longtime chef Gordon Wishard is the new owner (with Meredith Molli) of Columbia City’s best restaurant. Locals enter in pairs or small groups to sup on famously good pastas, and the affordable Italian wine list is nice, too. Specials here—perhaps a steak from locally raised beef or a perfect fillet of fish—tend to be ringers. [ Italian ] Tom Douglas has defined his own style of pizza with an applewood-fired oven and a distinctive, chewy-bubbly crust. The boldest flavors are best here, such as Penn Cove clams with pancetta and lemon thyme, or roasted pepper and fennel sausage. It’s inviting—a place that feels welcoming day and night—and the equally cozy loft space at the South Lake Union location offers brunch daily, too. [ Northwest ] Chef Charles Walpole is riding high in the iconic Eastlake strip-mall space that once housed a doughnut shop, Sitka & Spruce and Nettletown. A chalkboard menu reads like a chef’s dream—all carefully sourced meats and fish, prepared with flair but without fuss. Plus, good wine, blood red walls and the easy spirit of food lovers enjoying really good food. You won’t believe how good the house-made charcuterie—sausages, pâtés and cured meats—is at this sweet neighborhood deli. The sandwiches are boss, too, and neighbors know not to miss the steak frites at happy hour. [ Northwest ] Chef Amy McCray’s Green Lake hideaway begs for dinner daters, and her menu of seasonally eclectic dishes includes the best lamb burger in town and the utterly delicious Cabrales flan. We love finding such good food tucked away in Tangletown. P.S. : Wine is a passion at Eva, too. [ Pub ] You’ll find a true cross section of the neighborhood sitting on the bar stools and at wooden tables at this iconic Greenwood pub. The fish tacos and the Reuben are favorites. Kirkland locals pack into this friendly strip-mall eatery for kafta, gyro platters, falafel and soft pita with what locals swear is the best hummus in town. [ French ] At Thierry Rautureau’s French-American corner bistro, the mood is easygoing and welcoming—quite a change from the haughty air of Rover’s (which Rautureau will close in April). 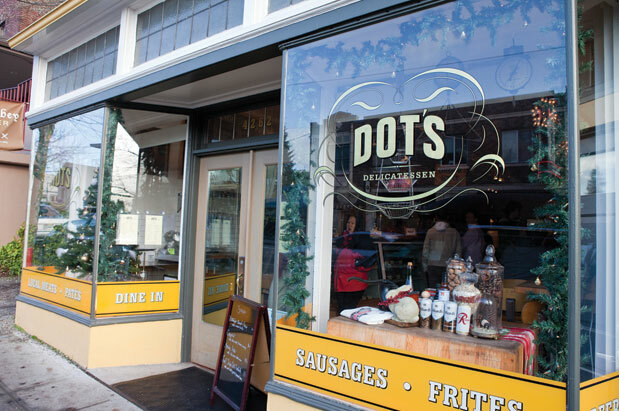 We love the house-made sausage, the steak frites are divine, and the wine list is bargain central. [ Italian ] Owner Carla Leonardi has been the standard bearer for delicious pastas (most notably a light-as-air lasagna) and wood-fired pizzas at this Montlake trattoria for more than two decades. Paper-topped tabletops and crayons keep the kids happy, but the place is fit for casual dates, too. [ French ] Seduce your date in this dim, candlelit hideaway in Pike Place Market with the seasonal cassoulet and a dusty French red. This is a true favorite and remains just hidden enough to not be overrun with tourists. A sure bet for spot-on French bistro fare. [ Eclectic ] Bustling enough for a special occasion, but easygoing enough for any night of the week, this eatery has a menu that makes the most of each season. Preparations are simple but impeccable. [ Eclectic ] At the newest café on top of Queen Anne, satisfying soups and a perfect fried fish sandwich at lunch, and a more ambitious dinner menu (including a great farro salad with citrus) have the neighborhood stopping in day and night. [ Eclectic ] A lovable collection of small plates—parsnip and pear soup, moules frites, assorted cheeses—and affordable glasses of wine keep this sweet neighborhood spot packed most nights. Don’t miss the warm gougères! [ Northwest ] Culinary power couple Lisa Dupar and Jonathan Zimmer do it all from scratch, from freshly baked pastries to pizza-like “firebread,” along with the newly opened Pombar, which offers a full bar menu. The colorful décor and open kitchen lend the industrial space (it’s also headquarters for their catering company) a warm, family-friendly feel. [ Pub ] South Lake Union’s second living room is loud, busy and fun. On tap: a who’s who of West Coast brews. To eat: great burgers, beer-boiled pretzels with clams and mighty fine brats. 21 and older. [ Italian ] Wacky décor—that’s a bike hanging from the ceiling!—and no reservations set the tone: It’s just dinner. But boy, that spaghetti with clams is spicy and good, and the kids are welcome, too. [ Eclectic ] There’s always something tempting on the menu at one of West Seattle’s most spirited bistros. Stop in for a glass of wine at the bar, or meet pals for brunch: The breakfast burritos and mascarpone-stuffed French toast are calling. [ Hamburgers ] With red vinyl booths, good beer and cheap, cheap prices, this White Center charmer is one of the best burger joints in Seattle. Find more recommendations in our online restaurant directory, which you can quickly search by neighborhood or cuisine type. Or, subscribe to the weekly Restaurant Insider newsletter and receive suggestions in your inbox every Wednesday.